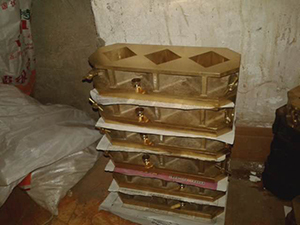 Optional accessories include an all brass fitted top, or a cover plate designed to pour molten sulfur capping compound down through taper holes for testing compressive strength. 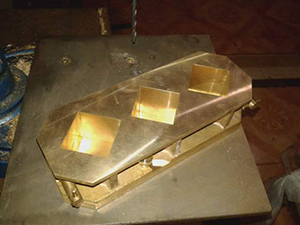 Machined out of brass material , the model is in the form of this three gang 2" x 2" cube mold for compression test cubes. This mold in a diagonal arrangement with a detachable brass base plate. Wing nut clamps lock the mold to the base while stainless thumbscrews secure halves tightly together. Large screed off upper surface area makes this mold a preferred choice. Optional accessories include an all brass fitted top, or a cover plate designed to pour molten sulfur capping compound down through taper holes for testing compressive strength.